Newcastle is New South Wales' second-largest city after Sydney and is becoming a regular fixture on several major cruise lines' itineraries. Set at the mouth of the Hunter River, a 162-kilometre drive north of Sydney, it offers the attractions of a big city while retaining the laidback ambience of a regional town. Its history as a working port goes back to the early 19th century, when steamships carried coal to Sydney. And while today it is the largest coal exporting port in the world, Newcastle is also known as the gateway to the Hunter Valley vineyards and has plenty to offer in the way of cool bars, exciting restaurants, cultural activities and spectacular surf beaches. The city was closely linked to Newcastle-upon-Tyne in England -- where many of the coalminers migrated from in the late 1800s and nearby towns such as Morpeth, Jesmond, Wallsend and Gateshead are named after their English counterparts. Its convict past is evident in sites such as the Bogey Hole, an ocean rock pool that was hand-carved out of the cliff. For an insight into some of the city's historic buildings, the three-kilometre Newcastle East Heritage Walk takes in the Customs House, Convict Lumber Yard, Fort Scratchley, Christchurch Cathedral and various convict-era buildings. The Newcastle Museum is also well worth a visit. Ever since the steelworks closed in 1999, Newcastle has been reinventing itself. Honeysuckle Wharf is now a lively promenade of waterfront bars and restaurants; Darby Street in Cooks Hill is becoming the hip and happening place for small galleries, cafes and curio shops; and wine bars and clubs are popping up in converted banks in the commercial district. Not many ports in the world display a giant welcome sign for visiting vessels and none other than Newcastle marks their departure with a gun salute. Cruise ships dock at the Channel Berth at the Carrington terminal. A free shuttle bus, organised by the Port of Newcastle, takes passengers to and from Queens Wharf, a 10-minute drive away, where you'll find a visitor information centre at the Maritime Centre, as well as a few waterfront places to eat and drink while watching ships, tug boats and a local ferry. A scenic tram ride departs from Queens Wharf, with commentary provided by the driver over 1.5 hours. Walk further up the street to the city centre, where there are numerous attractions, restaurants and beaches. A new cruise terminal is set to be built on the same site in 2018. A volunteer meet-and-greet team is on hand at the Channel Berth as passengers disembark to answer questions, distribute the Cruise Arrival Guide and direct you to tour coaches, shuttle buses, taxis and private pick-up areas. Although Newcastle is blessed with several beautiful surf beaches, you must always swim between the flags and -- if the beach is displaying a 'closed' sign -- don't give in to the temptation to go for a dip as conditions can be dangerous or there could be sharks in the area. A free shuttle bus will take you from the cruise terminal to Queens Wharf. Once you're there, getting around Newcastle is easy, and there are several transport options. By Bus: There's a free bus service in the central city zone and timetables are available at the Maritime Centre. By Taxi: Taxis service the Newcastle, Lake Macquarie, Port Stephens and Hunter Valley areas and wheelchair-accessible taxis are available on request. By Rental Car: Hertz car rentals is located at Maitland Road in the city centre; you can book in advance on the company's website. By Ferry: If you're planning on an independent sand-dune adventure or just want to spend a day on Stockton Beach, the Newcastle to Stockton Ferry Service route runs every half hour from 5.15am to midnight every day; the Newcastle terminal is at Queens Wharf. Central Newcastle is very easy to walk around and if you want to go a little further afield you can hire a bike from Metro Cycles at 2 Bellevue Street. By Rickshaw: Using pedal-powered pedicabs, Rickshaw Revolution (0477 776 245) offers a fun way to get around. City tours are also available with a rider-guide who shares stories of their personal and historic knowledge of Newcastle. The local currency is the Australian dollar. For current currency conversion figures, visit www.xe.com. There are several ATMs and banks in the city for obtaining Australian dollars. Credit cards are widely accepted. 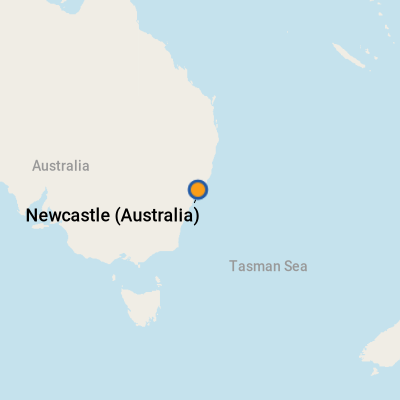 English, with an Aussie accent, is spoken in Newcastle. Locals are referred to as "Novocastrians". Whether you're looking for a casual cafe serving fresh local produce, a stylish wine bar where you can sample some of Australia's finest wines over a light lunch, or a more substantial gourmet experience, Newcastle offers dozens of top-class eateries. The key dining neighbourhoods are The Boardwalk on Honeysuckle Wharf, overlooking the harbour; Darby Street in Cooks Hill, where you can browse galleries and secondhand shops among small, individual cafes and restaurants; the inner city and West Newcastle areas, where exciting bars and boutique restaurants are popping up in between commercial buildings; and Hamilton's Beaumont Street, which is lined with pubs and pavement cafes. Rustica: Open for lunch Thursday to Sunday, the waterfront Rustica has jaw-dropping views across Newcastle Beach. The menu features Mediterranean cuisine, from tapas to seafood, focusing on local produce such as Port Stephens oysters, Upper Hunter lamb and Hunter Valley wines. Vegan and kids meals are also available, as well as liqueurs, whiskeys, spirits and cocktails. Groups are welcome with a booking. The $20 express lunch menu is top value, especially with that ocean vista. Choose from Moorish spiced squid, pork belly, herb and lemon crumbed chicken schnitzel, fish and chips, ratatouille salad or house-made spaghetti bolognese. If your cruise departs at night, an early dinner is possible: eat at 5.30 pm and be done by 7pm ($70 for lamb shoulder, vegetables and a bottle of wine). For a later dinner, the six or eight course banquets are highly recommended. Rustica is a short stroll from the Novotel Newcastle Beach. Pick up some retro, vintage or antique pieces at one of the 25 specialised shops in the Centenary Centre (29 Centenary Road). The Newcastle Museum shop (6 Workshop Way) has a good range of local history books, artist-designed Newcastle-branded T-shirts and unusual jewellery.